The woman in the gym listening to music on the phone. 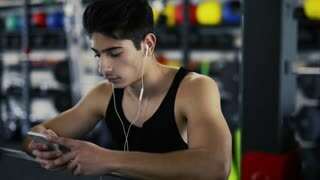 Hispanic man in gym resting, holding smart phone, listening music. 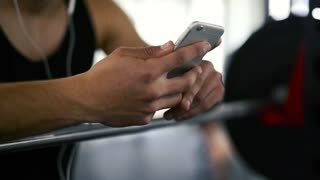 Hispanic man in gym resting with friend, holding smart phone, listening music. Good looking black man in t-shirt holding cellphone and listening to favorite funky music with bluetooth headphones on city street. 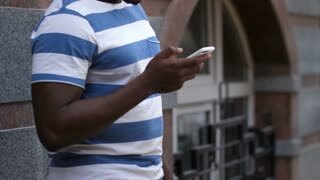 Portrait of african american guy with smart phone enjoying music. Senior man using mobile phone, holding smart phone, texting, surfing internet, and using app while rest in the park.